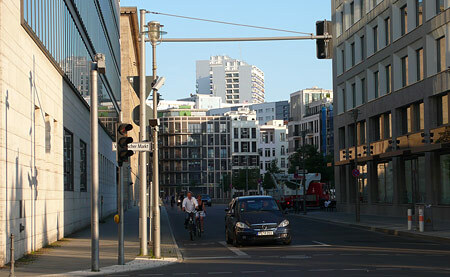 Having snobbishly berated Berlin for its lack of density in the post before last, it suddenly occured to me that I’d stopped in the street a day earlier to photograph exactly that. Admittedly, I used the zoom on my camera to flatten the depth of field, but only a little bit. And what, perchance, should be responsible for this slight whiff of metropolitain glamour? The Berlin Townhouses, also berated by us, way back in the day. We truely know nothing.